Beacon Hill musicians, poets, and more — you’re wanted for the Beacon Hill Boombox, a collection of recordings by Beacon Hill artists. The recordings will play in several neighborhood businesses in August and September. Are you a recording artist who lives or works on Beacon Hill? We are creating the Beacon Hill Boombox, an audio catalogue of artists who call Beacon Hill home. In August and September, the boombox will be located in several different neighborhood establishments, featuring the diverse sounds and expressions of Beacon Hill for all to listen to and experience on cassette tapes. We want to hear you! Submit your recorded work –- music, poetry, anything recorded! –- in order to be part of this project. Your recordings will also be featured online on a digital archive. Please send an MP3 or link to a stream of your work to beaconhillboombox@gmail.com. You can also leave physical submissions at The Station Café (16th Ave. S. and Beacon Ave. S.). The deadline is July 30th, so you still have time to put something together. The Tippe and Drague is almost open! Photo by Wendi Dunlap. Change is in the air in North Beacon Hill these days, with the long-awaited opening of the Tippe and Drague Alehouse just around the corner, alongside some new (and returning) art on view around Beacon Hill Station. 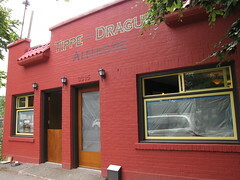 We’ve been hearing that Tippe and Drague (in the old ROCKiT space at 3315 Beacon Ave. S.) would probably open this week or next, but Seattle Beer News provides more details on the new establishment, and says that owners Melissa Cabal and Robert McConaughy plan to open next week if all goes well. SBN reports the opening tap list is heavily local, and the menu will include “simple but good food with fresh ingredients; don’t look for any fried food here.” Hours will be 4 p.m. until late, 7 days a week, with weekend brunches. 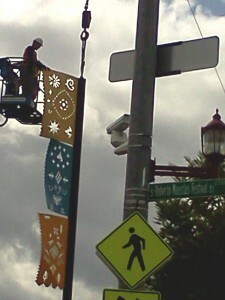 In other neighborhood change: the metal banner art designed by Carl Smool has finally returned to Beacon Hill Station. 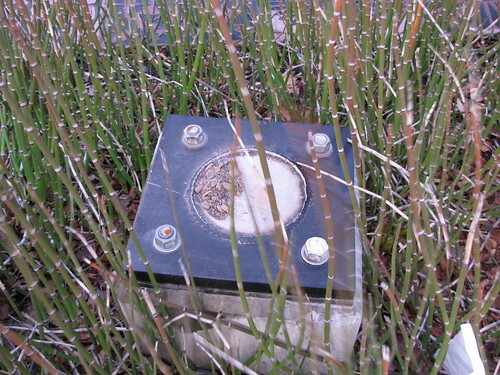 One of the flagpoles fell in a windstorm in March 2011, so the poles were removed to improve them for safety. 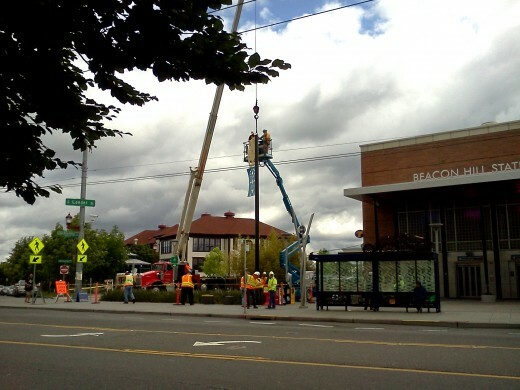 Earlier this year, Sound Transit tried to reinstall them but discovered a problem, so the poles were removed again. Now, the banners are back to decorate the station plaza once again. 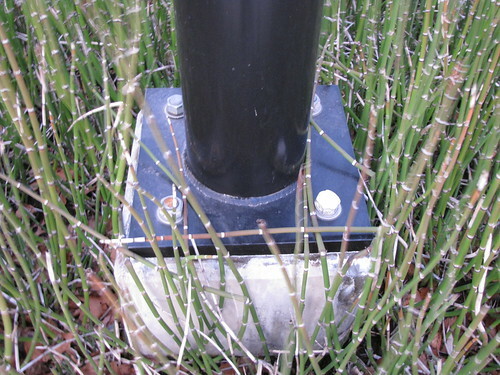 The original pole bases looked like this. Photo from March 2011 by Wendi Dunlap. Where one of the pole bases broke and fell. Photo from March 2011 by Wendi Dunlap. 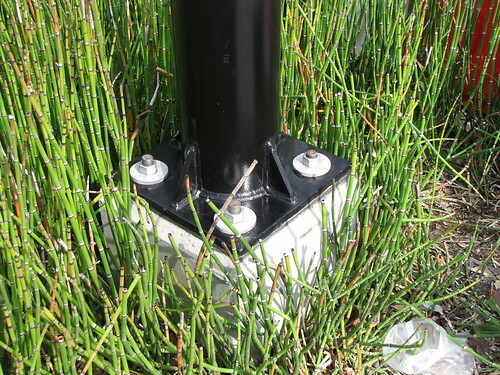 The retrofitted pole bases look like this. Photo by Wendi Dunlap. 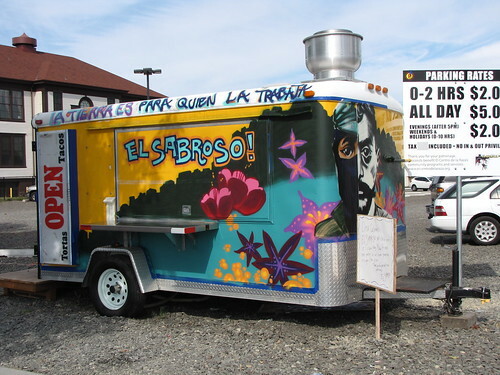 Just across Roberto Maestas Festival Street from the station, the El Sabroso taco truck is also looking more artistic these days. The truck was closed for a while this week while it was painted with decorative murals. The flags at Beacon Hill Station returned briefly on Wednesday before being removed again. Photo by Betty Jean Williamson. A few neighbors let us know on Wednesday that Sound Transit was restoring the metal “flag” artworks by Carl Smool to the station plaza. 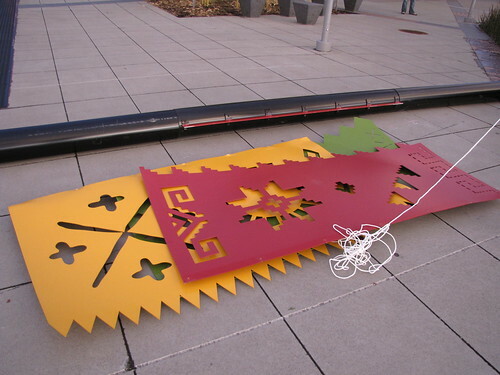 The colorful artwork, mounted on several poles, was removed for retrofitting after one of the poles fell in strong winds in March 2011. Also at Beacon Hill Station, travelers may have noticed some unsightly mess in the passage between the two platforms. 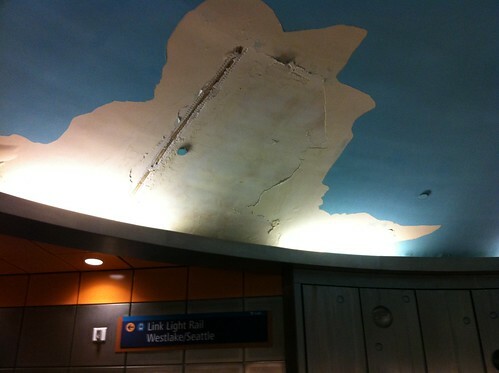 Gray tells us that that there is a leak in the ceiling there, but it is being fixed under warranty by the station’s contractor. Photo by Betty Jean Williamson. The leak inside the station passageway. Photo by Wendi Dunlap. Everyone is invited to Beacon Hill International School this Friday, April 27 for the unveiling of the new community tile mosaic mural. The unveiling celebration will take place from 1-2 p.m., starting with a ribbon-cutting ceremony by the fifth graders, followed by a school-wide assembly. The mural was designed by artist-in-residence Julie Maher from concepts created by students, parents, and community members, with the theme “We All Belong, A World of Learners.” (See previous local mural work by Maher here in this slide show.) A full year of work by the community went in to the creation of the mural, supported by a grant from the Seattle Department of Neighborhoods. Beacon Hill International School is located at 2025 14th Ave. S. For more information about the project, see the website. 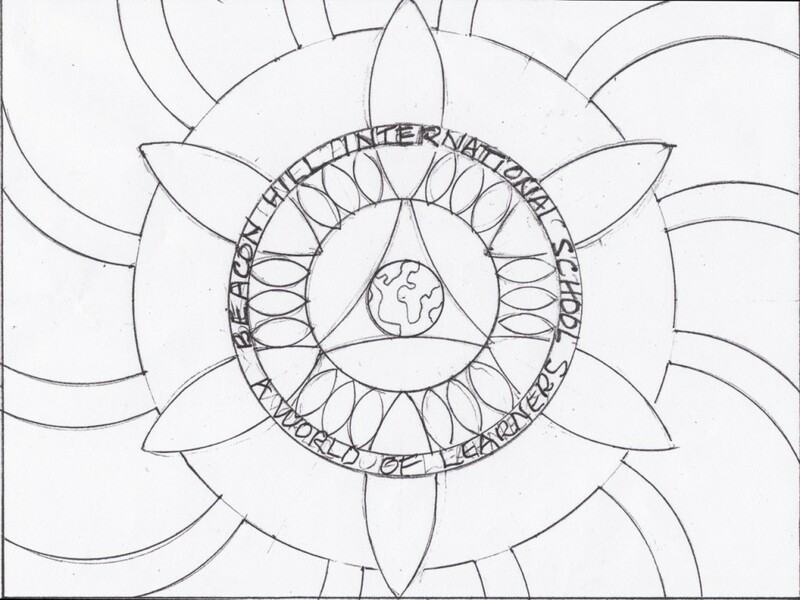 This was the basic design outline for the mural. This week, we'll get to see the finished work in full living color. 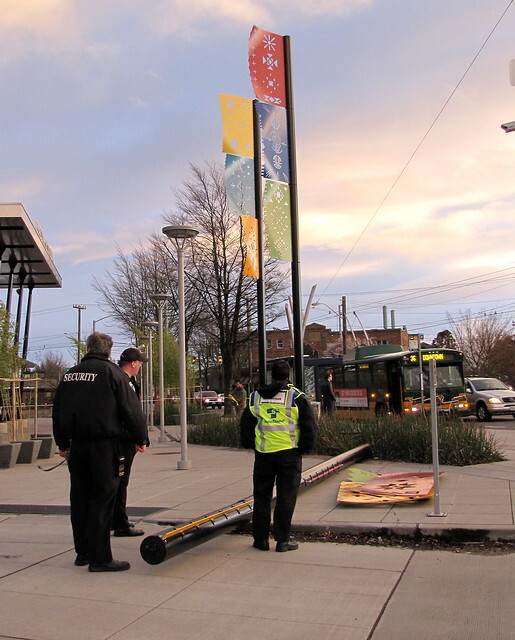 On March 10, 2011, one of the metal banner artworks installed on the plaza at Beacon Hill Station collapsed in a windstorm. Luckily, no one was hurt when the metal banner and pole hit the ground, but all three of the banner poles were removed as soon as possible after the collapse. 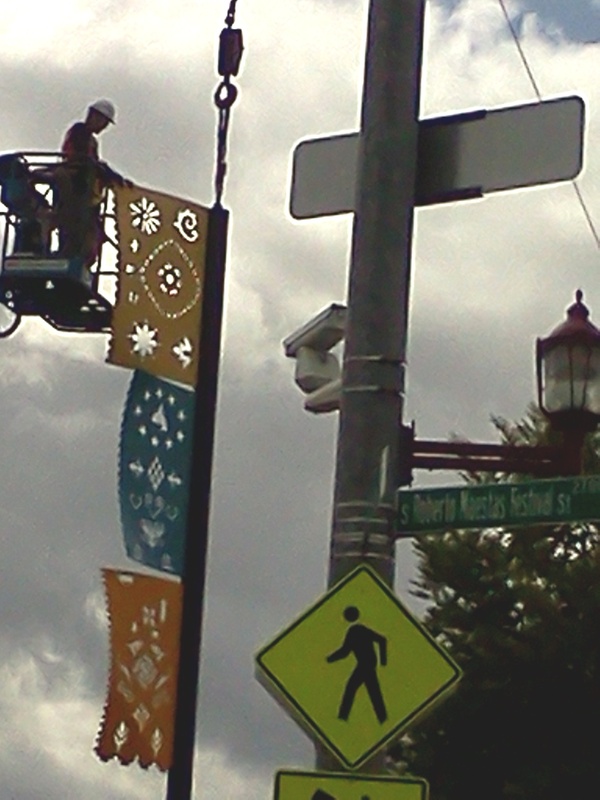 It’s been more than a year, and Beacon Hill community members were beginning to wonder if the colorful banners were history. 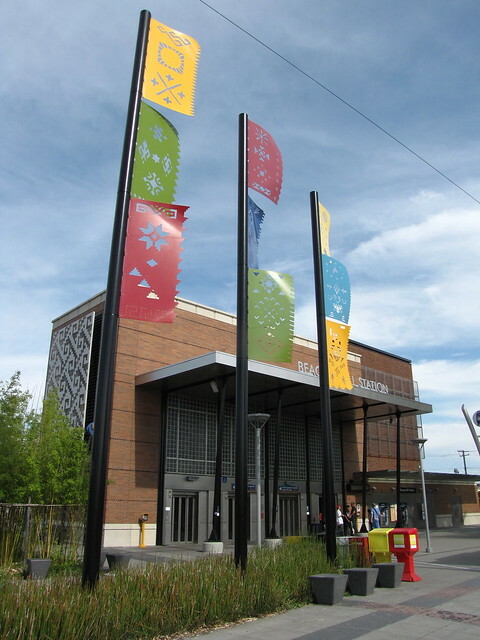 The flags are part of a larger work at the station by artist Carl Smool, Community Threads, which includes etched textile “carpets” in the plaza’s walkway and on a cut-metal louver on the outside north wall of the station building as well as the three cut-metal banners that flew above the plaza until the windstorm last year. Sound Transit security staff look at the fallen art banner at Beacon Hill Station, March 10, 2011. Photo by Wendi Dunlap/Beacon Hill Blog. 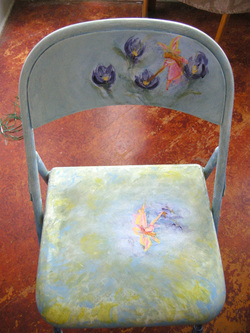 Art Chair #1, painted by Kathleen McHugh. Photo courtesy of ROCKiT space. As we mentioned in the last Beacon Bits, ROCKiT is hosting a community “sit-in” on Saturday, February 4 from 3:30 to 5:30 p.m. at the Beacon Hill Library to celebrate the completion of their art chair “fleet.” The chairs were decorated by more than 40 local artists and neighbors who volunteered their time to paint or collage chairs to be used at community events. The public is invited to this reception to view the finished chairs, enjoy free snacks, and celebrate all of the volunteers to took part in this and other ROCKit projects in 2011. Among the festivities will be a singalong of an original song, “This Chair is My Chair”; a haiku treasure hunt, a game of musical chairs, and much more. For more information, call 206-658-0187. We’re launching a new public art project on the hill and we want your input! With funds from a City of Seattle Department of Neighborhoods matching grant we will create a 6×8 tile mosaic to adorn the south-facing brick wall of the Beacon Hill School entryway. This spot is ideal for viewing by car or foot traveling along 14th Avenue South past the school. The mosaic will beautify a high traffic space that is frequented by Beacon Hill School parents, neighbors, students, staff, visitors, and community volunteers. Did you know Beacon Hill International School’s mission is to inspire lifelong learners and global citizens? Check out the preliminary design outline for the mosaic, exploring the theme of “We All Belong, A World of Learners.” (The design outline was created by artist-in-residence Julie Maher, based on concept work by students and the project steering committee, a mix of neighbors and school community members who support art). We want this to be an opportunity for the entire Beacon Hill community to come together as partners to create something special to be enjoyed by everyone. In order to do that BHIS will host tile-making workshops in the fall, open to the community (event dates will be announced in advance). In the meantime we hope you will take a moment to share your thoughts on the project and the design. Post your comments on the fabulous Beacon Hill Blog. Here’s the picture of the design. (Click the image to see a larger version.) What are your thoughts? Beacon Hill International School is seeking a “working tile artist who explores global themes and enjoys working with children” for a 6-week project in late summer/early fall of this year, working with K-5 kids to create tiles for a mosaic mural. The artist chosen will also bring the Beacon Hill community into the project, collaborating with neighbors to make tiles and complete the mural. The installation will be an approximately 10’x7′ tile mosaic, to be installed on the wall of an exterior entryway. Additionally, some smaller areas at the school and a nearby park may also be included in the project. The stipend for the completed mural is $2,000. The application deadline is July 29. This iconic Beacon Hill landmark is a "troubled building," unable to find a new tenant despite the best views in town. Photo by Wendi. 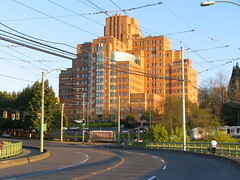 The Seattle Times (Beacon Hill Blog news partner) reports that the PacMed/Amazon landmark building at the north tip of Beacon Hill is a “troubled property.” No replacement for primary tenant Amazon has yet been found, though the building has been on the market for almost three years. The daily fine for an overdue book, CD, or DVD will change from 15 cents a day to 25 cents a day. The daily fine for an overdue interlibrary loan will change from 25 cents a day to $1 a day. Also, all accounts with a balance of $25 will be sent to a collection agency, including accounts for children and teens. You can find out more about the fee and fine increases at the library website. Angela Garbes of Seattle Weekly‘s Voracious blog notes a recent addition to MacPherson’s Fruit and Produce market (4500 15th Avenue South): day-old breads from Essential Baking Company. Yum! The Seattle Department of Neighborhoods and City Neighborhood Council (CNC) are currently seeking input from community groups throughout Seattle as a way to find out how to support the evolution of the Neighborhood District Council system as a key avenue for civic participation in Seattle. Please take this survey if you are interested in Seattle neighborhoods, and spread the word to anyone else who may be interested in helping strengthen civic engagement in our city. The survey will be open until November 14. We see on Craigslist that Salon Nouveau (2805 Beacon Avenue South) has a job opening for a salon coordinator. More information here. Seattle Public Schools Superintendent Maria L. Goodloe-Johnson will host a Community Coffee Chat for parents, grandparents and caregivers of SPS students on Monday, November 1 from 6:00 to 7:00 pm at Asa Mercer Middle School, 1600 South Columbian Way. El Centro’s Dia de los Muertos Opening Ceremony is Monday, November 1, at 5:30 pm. More information here. Election Day is Tuesday! Get those ballots in the mail now! Don’t forget to check our Events page for other upcoming events!